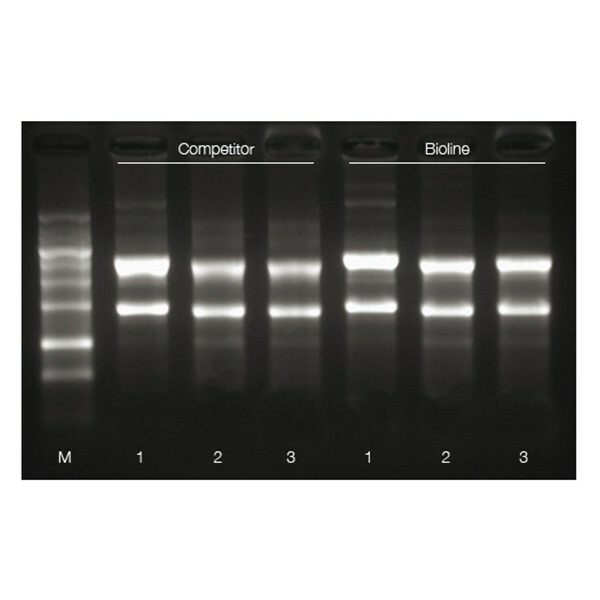 A reagent for fast, simple, scalable purification of high-quality total RNA, or the simultaneous isolation of RNA, genomic DNA and protein from a wide variety of biological samples. TRIsure provides a simple, efficient method for the sequential isolation of total RNA, genomic DNA and proteins from a wide variety of starting materials. By combining thiocyanate compounds with phenol, TRIsure facilitates disruption of cells during homogenization and effectively inhibits DNase and RNase activity. After homogenizing the sample with TRIsure, chloroform is added and the homogenate is allowed to separate into three phases: a clear aqueous phase (upper) containing the RNA, a green colored organic phase (lower) and an interphase, containing the DNA and proteins. The RNA is extracted from the aqueous phase by isopropyl alcohol precipitation, DNA is precipitated from the organic layer with ethanol and the proteins are precipitated from the phenol-ethanol supernatant by isopropyl alcohol precipitation. The precipitated RNA, DNA, or protein is washed to remove impurities and then resuspended for use in downstream applications. TRIsure allows for highly reliable integrative analysis of the transcriptome, genome and proteome, since the RNA, DNA and proteins are derived from the same sample and the same cell population. The simplicity of the TRIsure method allows simultaneous processing of a large number of samples and can be used in a wide variety of downstream applications including expression profiling, epigenetics, genotyping, transgenic analysis and cell line characterization. TRIsure and an equivalent kit from supplier I were used to extract total RNA from 3T3 cells (Lane 1), mouse kidney tissue (Lane 2) and mouse liver tissue (Lanes 3). The result demonstrates the consistently high yield and quality of total RNA isolated using TRIsure. Column-free extraction of high-yield and quality RNA extraction. Please refer to the ISOLATE II Selection Chart to confirm the applications for which the TRIsure is recommended. All kit components should be stored at +4°C upon receipt. When stored under the recommended conditions and handled correctly, full activity of the kit is retained until the expiry date on the outer box label. TRIsure is shipped at room temperature. "Our research applications require large amounts of bacterial RNA. We changed ...	"
Our research applications require large amounts of bacterial RNA. We changed to Bioline’s 'TriSure' as we found it provided comparable yield, purity and ease of use at a very competitive price.